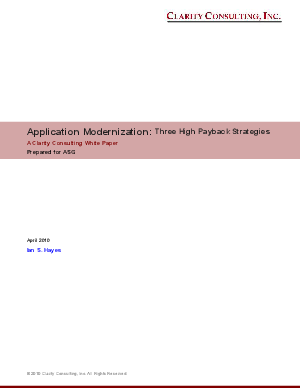 Application modernization is a powerful method for extending the life and improving the business value of a company's critical application assets. It provides an attractive and cost effective alternative to application development, enabling companies to defer investment in replacement initiatives without compromising business support. Companies can avoid the risk of new development projects while using quality improvements to lower the business risk and impact of application failures. Application modernization provides immediate reduction in the cost and effort of application maintenance and enhancement by increasing programmer productivity and decreasing production defect rates.